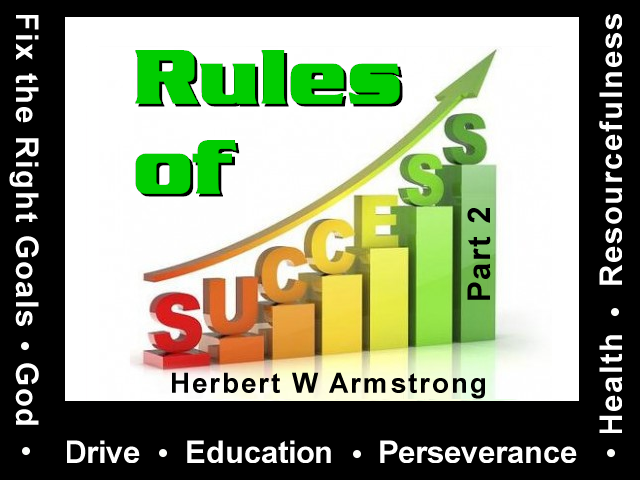 Note: Rules of Success - Part 3 is missing, if you have a copy of the Radio Braodcast, could please contact us at the "Comments or Suggestions" link at the bottom of this page. Thank You! Why is it that so many people make a failure out of life? And yet, some make a success of it. This is the second of a series bringing you the Seven Rules of Success, for there are certain definite laws in motion that regulate success or failure, health or sickness, happiness or unhappiness. These things just don't happen, there are really causes, and there are seven basic rules for achieving success in life. They determine your success or failure. No person need ever be a failure in life. Every person was put here on this earth to become a success, and every person is endowed with the full possibility of achieving success. Not necessarily everyone the same objective, or the same success, or the same degree, but everyone can be a success — when you know what a success really is — if these basic principles are known and applied. Do you know why there are so many tragic failures in this world? Do you know why there is such a mountain of unhappiness in this world? It's because most people never apply a single one of these seven basic rules. Most people probably don't even know what they are. I wonder how many of them you know? How many have you ever applied? Well listen carefully, pay close attention, jot down notes, take notes on this so it won't ever get away from you. This may be worth thousands and thousands of dollars to you and it isn't going to cost you a cent! So apply these rules and see what a difference it makes in your life. Now, as I mentioned in the preceding program of this series, I'm going to give you these seven rules in their time order, not necessarily in the order of importance. In fact, the most important rule, I shall mention last and not first. Well now first then, in time sequence, is simply the fixing of a proper goal, having a goal or an aim in life, knowing where your are going, having the right purpose. Success is absolutely impossible my friends, unless you know where you are going. It's impossible unless you are strongly motivated, unless you have ambition to achieve it. You can't be motivated and you can't have that ambition unless you're imbued with a definite purpose. Now where are you going? Are you just drifting where circumstance buffets you around? Just looking, as most people do, to enjoy the passing moments of the present, not looking ahead at all. No goal. No definite purpose in life. But at the end, where are you going to be? Now is the only thing you think of; the fact that you find of necessity you have to eat and have to have some kind of a place to sleep and to rest, and you do need clothes. And so you have to work. And so you get some kind of a job, just wherever it happened to be. And there you go, slaving away just trying to keep body and soul together, and you're having a hard time making ends meet too, aren't you? I think practically all of you really are. Well, earning a living should be only a means my friends, to the real objective. My friends, you were born for a purpose, but very few know what it is. Very few people have any ambition or vision at all. Now education is not merely book learning only. My friends, it includes the development of the whole person — of what we are — to make us a real success. Now many try to fix a goal by asking, "Well am I going to be a doctor? Am I going to be a lawyer? Am I going to be a salesman? Am I going to be a farmer? Am I going to be a mechanic, or am I going to be a scientist, a teacher, a writer, a minister, a clerk, a bookkeeper? What am I going to be? What kind of a job will I take up? Will I be a plumber? Will I get into business? Will I run a store? Will I build and develop a factory? Will I get a job in a factory? What will I do?" Or, "Will I be a stenographer, a librarian, an office manager, or what? What specific job shall I prepare for?" Well, that's important, but still there is something else that's even more important, because my friends, if you are ever going to really be a success in life, you must have a broader goal than that. That is your secondary goal. And as I think I mentioned, when I was a young man twenty-three years of age, I was sent all over the United States, as I mentioned in the preceding program, interviewing business men about the methods that they used in achieving success. And studying why some were a success and some were a failure. I came to the conclusion that so far as success in business was concerned, that the cause of most failures was fitting the proverbial square peg in the round hole. Most men were in the wrong line of business. They could have been a success in some other business, but they were not in the business where they belonged. By nature they weren't fitted for that particular kind of job, business or profession. They could have been a success some other place, and so it's necessary to find what are your aptitudes, where do you belong? Because some place you can make a success. Now most have a sort of a general, vague desire just to enjoy life, as I say, the passing moment as you go along. Take the average young girl. Now a lot of girls just want to look pretty. I suppose there may be some girls that don't want to look pretty. Well I've never found one of those yet but there may be some, but most girls want to look pretty. And a lot of girls want to have an attractive figure. They like nice clothes. They want to be well thought of. Perhaps some of them want to be whistled at, and some of them want to get a husband. That might be their objective in life. And some of them just want to find happiness. Some would like to be business women so that they could manage men. Well I can tell you right now, that's a wrong objective. It isn't really going to make you happy, but probably those who want that objective aren't going to agree with me. They're going to go ahead and they'll have to have their headaches and bump their heads and find out by cold experience. We were put here, you know, to learn by experience. Some won't learn any other way. Now, well let's get to the men. Well, a lot of men want to be important, and they want to be thought of as being important by other men. I know that was always my trouble, that was my disease as a young man. I had to get over that. Men want to be well thought of too. Yes they really do, they want to be well thought of. They want to enjoy life. They want to find contentment, and of course, they want security. I think both men and women want security. And many men want security so much that they are willing to sacrifice higher opportunities and bog down on most any kind of a job that looks like it's absolutely secure, with some very large corporation or a government job, or something where you figure that your employer is never going to go broke, he'll always be there and you've got a job for life. And then after age sixty, sixty-five or seventy, you'll get a pension, so that you don't have to fear what'll happen in old age. And many people are willing to work for smaller salary, less income, if they can just have that security and not have to worry about the future. Well nearly everybody has a very high opinion of self, or wants to have a high opinion of self, and nearly everybody is just wrapped up in his own self. Of course that's something that's true for all people, men and women alike. Well now, of course, we need to fit the specific job or profession, that's true. But as I say, that is really a secondary consideration for overall success in life, because success is more than merely making money. Now aptitude examinations may help you that way. I remember that when I was a young fellow of eighteen years of age, I found a book; I don't suppose that book's around anywhere now, I haven't really looked myself because I went through it years ago. The title of it I remember very well though, it was 'Choosing a Vocation.' I don't remember the author. It took me through a course of self-analysis, analyzing all aptitudes and likes and dislikes and strong points and weaknesses, any possible talents and also the lack of it, and where you would fit. And then an analysis of various professions, occupations, jobs of all kinds, to see where your particular talents and abilities in the things you like to do will fit in, and where you can avoid the things that might handicap you, and where you have the best chance of success. So far as choosing a profession, or a job is concerned, everyone ought to make some sort of an analysis of that kind. Perhaps you can find a book in the public library. I would suggest to any young men especially, that — or girls either, if you think you want to have some kind of a career. Of course a lot of career girls never make very successful wives, and you examine the divorce records and broken homes, and I think you'll find that there is a much higher percentage where the wives have been career women and where they have been set on some kind of a job that's kept them very busy, and they've had to have their whole mind on it instead of home, taking care of the home and children, than those that have been housewives. But nevertheless, I think it is a good thing to know what you fit and where you fit. But earning a living is only a means to what should be the main purpose in life. Now why were you born? Were you put here for a purpose or did you just happen? You know my friends, that nothing just happens, everything has been worked out by design. Everything about you has been planned carefully and worked out and designed. Why, I tell you my friends, the human body is the most marvelous mechanism that you know of, if you look around you. Anything that exists, there is nothing as marvelous as a mechanism that operates and functions and works as the human body. And everything you need has been thought out and planned and designed and put right there in this body, including your mind. The human mind, what a marvelous thing it is. Even the human hand; you never think about it, but you know, if you would put a human mind with its creative ability to think out ideas and to plan or to invent something, a machine for instance that could think out how to make some marvelous machine or mechanism, and you put that kind of a mind on any animal, or any kind of a living creature that we classify in the animal kingdom as we do classify men. Do you know that that other creature couldn't produce what he could think of, because he lacks the hands, the two hands with the ten fingers on the two hands. Absolutely with our minds, even though we have the minds we do, without the human hand we could not produce the things that are being made and produced by the human family on this earth. I tell you, that human hand is a marvelous mechanism. We take it for granted, we just use it all the time, don't think about it. I mention that every little while, many of you, our older listeners I know have heard me mention that before, but it's very important. That's one of the things I think we should appreciate. Perhaps we should give God a little thanks for having designed the human hand along with the mind and everything else that we enjoy. Well people are seeking pleasure, they want money, and many people think that money is the measure of success. I tell you my friends, I feel that every man who is a success will not necessarily lack the money for the things he needs, but he isn't necessarily going to be a wealthy man. Many men have achieved really eminent success and they have had happiness. Their lives have been a great success, who were not wealthy men at all. Well here's a man that looked for pleasure. He was looking to find out what he could enjoy. He looked around to see what other people were doing, and most people they were; well they were trying to become men, trying to become important with great achievements, of great things, or great works. Or they were going after every pleasure; some people after music, other people after other things, sports, everything of the kind and this man was in position to just indulge in every one of these things — clear to the full — and see what it would do. This man said to himself, "Come now, I'll make a test of pleasure." (Ecclesiastes 2:1) He said to himself, "Just enjoy yourself," he said to his own self. But he later wrote this; "And behold, this also was vanity." (Ecclesiastes 2:11) He finally came to the conclusion it was nothing but vanity! This man said, "I made great works." (Ecclesiastes 2:4) Like a government makes great works, a great dam and things of this sort. This man himself alone made great works. In fact this man was the head of a great government. Well now, about this time, maybe you can guess who this man is. This man was also the wisest man that ever lived, and one of the wealthiest. And he was the king over the nation Israel in times of old — Solomon. Now here was old Solomon, the wisest man that ever lived, and he was experimenting with life. He was in position to do it, to find out what would make him happy and what wouldn't. So he said, "....I had great possessions of herds and flocks, more than all who had been before me in Jerusalem. I also gathered for myself silver and gold and the treasures of kings and provinces. I got singers, both men and women...[So he enjoyed beautiful music, probably had hundreds of trained singers to sing for him,] many concubines, man's delight." (Ecclesiastes 2:7-8 ) You know so many men think if they could just have more women they'd be happy. I wish they could wake up. You know, we were designed so that one woman, the right woman, can make a man really happy. Well now, I've learned that by experience. I wish more of them could. But here was a man that had to learn the hard way. He had a thousand women. Think of that. I tell you, a lot of men today think that if they could just have a lot more women. They don't want to be true to one wife, they want to step out with other women. They want to cheat on their wives. It was all nothing but a lot of vanity to please the self, and vanity comes from the word 'in vain' — from the root. It means something that is, well it's just worthless and yet you puff yourself all up thinking about it. And do you know, my friends, that the very root of your nature, every one of you, is vanity. Every one of you, the very basis of your nature is vanity, we all have it. I have it and you have it and we all do. You know, when he got through, he felt he had had just as much as if he'd striven after wind. He'd reached out and perhaps picked out a handful of wind. ALL THAT EFFORT my friends, I can reach out right now and get a handful of wind. I can't hold it very long, but you know I don't have to expend a whole life time and millions of dollars and all of that to get it. What have I got when I get it? Nothing, nothing, and that's the way it was. You know, I used to think that Solomon surely must be wrong about one thing. He might have been the wisest man that ever lived, but I couldn't believe he was right when he said, "all is vanity," but I assure you it is. I used to think, well that a lot of people have greed. Surely, but why do you have greed? That's just vanity. It's just love of self and wanting everything for self. That's greed, and it's vanity, it springs from vanity. Vanity is the very root; it's the very substance of human nature, of the carnal mind and the carnal nature. Well, so you see my friends, these material objectives and the things that most people set their hearts and their minds on are not going to lead to success. Things that leave you empty in the end, things that leave you dissatisfied and discontented, certainly are not leading you to success. Now were you put on this earth for a purpose? Look at the world today, it is facing annihilation. This world is facing suicide. What's wrong? There is one root cause; we've all had faulty, false education. We have not come to know the true values. We've sought false things, we have had false objectives, we've had wrong goals. We've been striving towards the things that do not make us happy. The very first rule of success is to know where you are going, to have the right goal, to know what is your purpose for having been put here on this earth. And I tell you, no man is ever going to make a success until he first learns that. Now in our educational system in this country, of course we think the three R's, as they are commonly known. You know, 'reading, riting, rithmetic,' are important and so they are — that's just elementary. But the most important thing to know is something that is not taught in our elementary schools. It is not taught in our High Schools. It is not taught in our institutions of higher learning, the Colleges or the Universities so far as I know, except in one. I know one where it is taught. Perhaps most of you don't know too much about that one and that is this, here is the essential knowledge, here are the things you really need to know. What are you and why are you and how did you come to be here? Were you put here for a purpose and what was it? Where are you going, and what are the laws that operate along the way? How did you get here? Were you born for a purpose? Now if you were my friends, that purpose ought to be your goal. Is there a divine plan, is there a Creator? Did someone think this plan out, design you, your mind, your body and see that you would be born? Was there a purpose in it, was there design behind it? I think we need to look and see if there is a Creator and what was His plan, what is His purpose, how is He working it out? The first thing I wanted to know, IS there a God? I dared to question that I'd been brought up in a Sunday school believing there was a God; I'd always been taught there was. I had been taught that what I learned in Sunday school came out of the Bible, and then I began to really look into the Bible for the first time for myself to see what it says and what it means, and I began to find out that most of the fundamental teachings, or doctrines, or beliefs that I had been taught in Sunday school, were exactly the opposite of what the Bible said. And my head was swimming. And I said, "Well now, is there a God? And if there IS a God, did HE inspire the Bible, and can I believe THAT? What CAN I believe? Shall I believe the Bible or shall I believe what I was taught in Sunday school?" because the two were absolutely contrary the one to the other. At the same time I began to study evolution. Evolution is the atheist's explanation of a creation that exists without a Creator. How did it get here? They try to theorize out the idea of evolution, so I was studying that too and I found that science doesn't believe in what I was taught in Sunday school, nor does science believe what I found in the Bible. They don't believe either one. It's all a silly superstition apparently, according to some highly educated minds. Now shall I believe in science? Shall I believe in the Bible, or shall I believe in what I was taught in Sunday school? There were three different views — all disagreeing with each other. And so I had to prove by the laws of science whether there is a God, and I proved it. If you want that proof, write in for it and I'll send it to you. I've been able to prove it to atheists since. Now I won't say I can prove it to any atheist because some of them wouldn't admit it and some people you know, believe only what they are willing to believe, what they want to believe, and some of them are so reluctant to accept the truth that it's like leading a mule up to water but you can't make him drink. You couldn't make some accept it I suppose. But I am sure I could prove it to any open mind, except that a lot of people profess that they have open minds when they really don't. "I am God and there is none beside me. I form light and I form darkness: I create good and I create evil. I the Eternal do all these things" (Isaiah 45:6-7 paraphrased). Telling the end from the beginning, foretelling what's going to happen and bringing it to pass; pronouncing sentence on various cities and nations and empires, and making it happen down through the course of history. Was it just a man that wrote those words thousands of years before all these things happened and brought them to pass — or was it God Almighty? I proved that there is a God. Then I began to look to see what that God says. Now let me give you a little of it. You begin in the first chapter of the Bible in the first chapter of Genesis. The word for 'God' was written in the Hebrew language originally, not in the English, we just have a translation. This was written by Moses way back hundreds and hundreds of years before Christ, two thousand years ago. He wrote this in the Hebrew language, and the Hebrew word for 'God' was 'Elohim,' and we translated it into the English word 'God' and that name Elohim that Moses used to describe God, is a uniplural, it means more than one person. That is the same form and shape and image. A little calf is born in the image of its parents, it grows up to be just like its mother or father. And so you read here in I Corinthians 15 that; "...man is of the earth, earthy:...And as we have borne the image of the earthy, we shall [also] bear the image of the heavenly" (I Corinthians 15:47,49 KJV). Or the spiritual image through Christ and through salvation and that's God's plan. God Almighty then is reproducing Himself. That, my friends, is the PURPOSE for which you were placed here on this earth. I don't think you grasp it, and I'll try to make that plain in the next broadcast in this series. So I'm going to continue: there's quite a little more first on this purpose of life and setting your aim, and then we're going to come to the other six principles of success. Now, I just have about 15 — 20 seconds here in closing. Don't forget to write in for this booklet, 'The Seven Laws Of Success.' If you want to know why so many people are poverty stricken, you need to learn this, The Seven Laws Of Success. So till next time then, this is Herbert W Armstrong saying, "Goodbye friends."